Teaching your dog to accept brushing will take some training, but will be very beneficial to the dog once he is accustomed to the process. Daily brushing is most beneficial and will help to establish a routine for your pet, but brushing twice a week is acceptable if your schedule can’t accommodate daily brushing. Choose a quiet time and place to start the brushing. It is best to teach your dog to accept brushing while he or she is still a puppy. If you have an older dog, the process may take a little longer. First, call your dog to you in a friendly voice. Start by rubbing your finger or a soft cloth over the dog’s teeth in a back-and-forth motion. Once your dog is comfortable with this, you may try letting him or her taste a little bit of toothpaste from your finger. Pet toothpaste is recommended and is very appetizing to most pets. It may make brushing more enjoyable for them. Human toothpaste should not be used as it can result in the pet having an upset stomach. Once your dog has accepted the taste of the toothpaste, apply a small amount to a toothbrush and begin by raising your dog’s lip with your free hand, then brushing one or two cheek teeth in a straight back-and-forth motion. Try to hold the brush at a 45-degree angle to the tooth, with the bristles pointing toward the gumline. You will need to open the dog’s mouth slightly in order to reach the lower gumline. 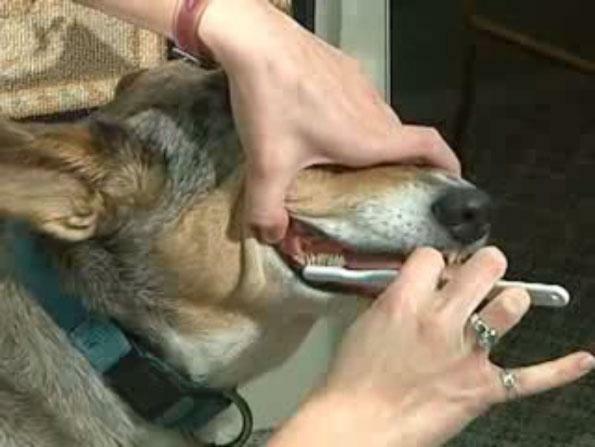 Work from the back teeth toward the midline of your dog’s mouth, then switch to the other side. Gradually work up to brushing all of the teeth (this will probably take several days). Make sure you reach the big teeth at the back of the mouth. Generally, only the outer surfaces of the teeth need to be cleaned because the tongue tends to remove plaque from the inner surfaces. Try to brush for approximately 30 seconds per side. Make sure you give your dog plenty of praise and offer a treat after brushing. This will make the experience more positive and will make it easier to brush the next time. A dog’s mouth houses plenty of harmful bacteria, so it is a good idea to wash your hands and the toothbrush thoroughly when you are done.